OK. This isn’t really genre travel, but I thought it would be of interested anyway. 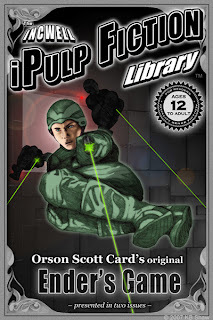 In celebration of the 30th anniversary of Orson Scott Card’s “Ender’s Game,” iPulp Fiction Library will publish this classic story exclusively online. First published in the August 1977 issue of Analog, Ender’s Game tells the story of a child prodigy being groomed to command Earth’s starfleet in a war against an alien race. It has since spawned an epic series of novels that spans thousands of years and traverses the known universe and beyond. “Cheap short fiction – it’s the lifeblood of literature,” Mr. Card said, commenting on the literary value of pulp stories. The iPulp Fiction Library updates the legacy of dime novels and pulp magazines, providing free, quality genre fiction to new generations of readers age 10 to adult. You can find iPulp at www.incwell.com or www.ipulpfiction.com. Ender’s Game will be published in two parts, starting with the July 1st issue. A version of the story formatted for optimal viewing on the Apple iPhone will also be posted.